Blindspot makes a blatant Matrix reference in "Senile Lines" and that's symbolism candy for me, so I'm going to run with it. The case of the week continues to be the most boring part of Blindspot, so I'm going to breeze through it. It's starts with one of Blindspot's more bizarre cold open. Two foster children seem to be fighting and after a hard cut, one of them falls through the top floor window of the house, while the other looks down. Of course, it looks like the boy killed his sister and he goes on the run. The case is flagged by the FBI when one of Jane's tattoos leads to a non-profit agency which is funding the foster home. Odd, right? Right. It seems this "non-profit" agency is actually using the foster children as Guinea pigs. They are testing illegal drugs on the children and... the girl who died had an adverse reaction. Yeah, that's pretty messed up. 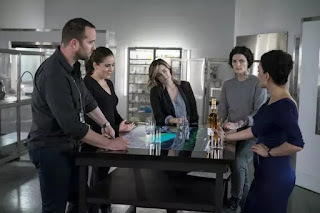 Of course, Team Blindspot stops the doctor and foster mother behind this insanity and manages to save the foster kids before they euthanize all of them. The red pill or the blue pill: that's the choice Neo is presented with in the Matrix. He can take the blue pill and remain in comfortable dreamworld of the Matrix, or he can take the red pill and confront the painful reality. Neo chooses the red pill. He chooses truth. He chooses what is real. Lies are a constructed reality. Lies hide the truth, which keeps someone from seeing the world as it truly is... and make choices for themselves based on that truth. When we lie to someone, we are controlling their reality and thereby usurping their free will. Sometimes we even lie to ourselves in order to construct a world that is easier to live in. Is that really living though? Blindspot examines this in "Senile Lines" with two characters: Roman and Reade. Roman's memories were zipped by Jane, a secret that she has been keeping from him for quite some time. No matter how much Roman tries to obtain a sense of self, and regain a sense of his reality even without his memories, the world in which he lives in is always going to be false because of this lie. It's the world of Jane's making and not Roman's. Despite her good intentions and insisting she "didn't have a choice," Jane is picking and choosing what information to share with Roman... and with Weller. It certainly gives Jane a sense of control over the chaos of her own reality; but in the end, Roman is living in a dreamworld. He needs to know the painful truth. That is the only way he'll be able to make a choice about who he is and stick with it. There are a couple of beautiful moments with Roman. He's the first to deduce that this young boy did not kill his sister. Roman remembers what it was like to kill someone for the first time and says, "Elie isn't scared of himself. He's scared of something else." For someone with no memories and who is supposedly a killer, this is an incredibly perceptive and compassionate response. Then has the chance to escape during the raid, but instead he saves the foster kids. It's an exceptional moment for the character and proves the good heart that Jane has always seen is real. Now, would Roman have been able to reach that compassionate soul without the zipped memories? Perhaps... and perhaps not. We certainly are the sum total of our experiences and memories, but they don't have to define us. We still have the ability to choose, but Jane lives in fear of Roman's choice. She fears if she doesn't tightly control his reality, by zipping and lying to him, then she'll lose him. That's not real love though. Nor does it show the real faith Jane has in Roman's goodness. If she loves her brother — if she believes in him — then she has to give Roman the painful truth and allow him to choose for himself. It's the freedom Weller gave Jane, and it's what Jane owes her brother. The second character is, of course, Reade who has been lying to himself and basically doing anything he can to escape reality — to live in the dreamworld where he wasn't sexually abused. The problem is, we cannot hide from the truth. It finds us eventually. Reade's false reality is being held together through drug use. He's trying to escape his reality, but it's only leading to his destruction. It takes talking to a complete stranger in the hospital, as Reade recovers from his injuries, to get him to see that. The soldier explains to Reade that he was only able to start healing and moving on from the loss of his fellow soldiers after his therapist made him look at photos of their dead bodies. It became real. He couldn't run from it anymore. He advises Reade not to do it alone though. So Reade decides to set aside the blue pill (the drugs) and reach for the red pill (the video). He's finally ready to watch it. Not because he wants to, but because he has to. He can't hide from his reality anymore. He listens to the solider though. Reade doesn't do it alone. He calls Zappata. Then, as she holds his hand, Reade presses play. I've often wondered who would be the person who would get through to Reade. Who would be the person to help him find his way out of the dark? It turns out it was two different people. The solider got through to him and Zappata helps Reade find his way through. A stranger and the person who knows him best. Blindspot also held true to their promise: the team lost a member. As predicted, Nas sacrifices herself to end Weitz's investigation — which, by the way, was absolutely ridiculous. Weitz was asking all the same questions we were, so the more expedient way to get answers would be to join Team Blindspot, not investigate them. But Weitz is a supreme jerk, so what else do we expect? I always love Archie Panjabi and I did enjoy Nas this season, but they made the right call. Her storyline has played out. Every time I look at her, I think of Rachel's comment about Phoebe from Friends, "She lifts right out!" Of course, Nas proves she's part of the family by sacrificing herself for the family which is wonderfully poetic. However, I would like if she came back to take down Sandstorm in the season finale. Honestly, the best part of Weitz's interrogation was him demanding Kurt describe his relationship with Jane Doe. Now we're talking! These are the questions that need answers! Kurt says they go for beers after work sometimes. Snort. I speak fluent Kurt Weller, so allow me to translate: that means he wants to have all the babies with Jane. Of course, Kurt is Kurt and has to fall on his sword. He decides he's going to take the fall for the team and Jane cannot hide her feels: "There is no team without you." I also speak fluent Jane Doe, so allow me to translate: that means this work means nothing without him. Kurt makes Jane's life real. During her interrogation with Weitz, Jane shouts that Weller trusts her. And she's right, which is a stunning place for them to be in given where we started. But JANE needs to trust that. She has to believe that if she's honest with Kurt, she won't lose him again. They will never have a real relationship unless they find their way through the painful truth. That's life... that's love. Jeller is almost kissing in the promo! DANCE PARTY! It's going to be a long wait until the next episode. I want Jane and Kurt to hold hands while they interrogate together. It's possible I have unreasonable expectations. I really wanted someone from Team Blindspot to beat the crap out of Weitz. Wildly disappointed it didn't happen. The solider was wrong — you can never watch enough home improvement shows.